Use "Link & Think" digital learning guides in your classroom to spark active thinking in your classroom. 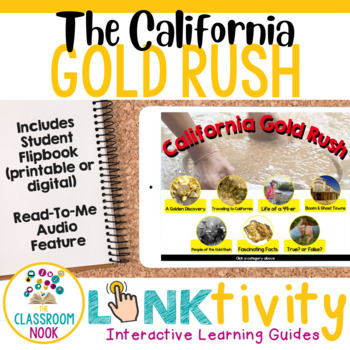 Take your students back in time to the California Gold Rush with this digital learning guide! In addition, while using the digital learning guide students will complete a flipbook to highlight the information that they learned in the guide. 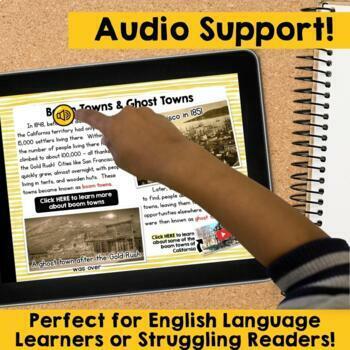 This guide can be used as a whole class by projecting the guide on a SMARTBoard or white board, or even as individuals by using personal tablets, iPads, chrome books...etc. 1) A teacher guide for using this resource - video tutorial included! 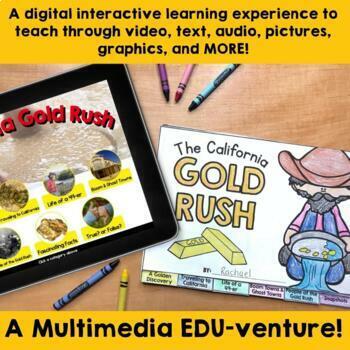 2) A kid-friendly 55-slide interactive, digital learning guide provided in PDF formatting as well as google slides. The guide is loaded with hyperlinks to allow students to easily navigate around the guide by clicking on different images and text. 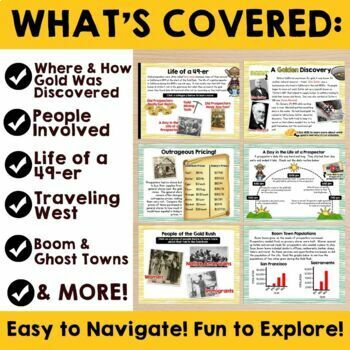 Need a complete unit on Westward Expansion (that INCLUDES this digital learning guide and flipbook)? Click HERE! Note: Do NOT purchase this resource if you already own my Westward Expansion unit, as it already includes this guide and flipbook. SEE MY ENTIRE LINK & THINK LIBRARY HERE!